I am the new editor of the Journal of Youth Development (JYD) which is dedicated to advancing youth development practice and research. JYD serves applied researchers and evaluators as well as practitioners who work in youth-serving organizations or the intermediaries that support them. JYD fills a critical niche as a place for applied scholarship and practice-based work -- in other words, relevant and useful studies about and for those working with and on behalf of young people. As editor, I'm seeking articles that feature applied research that can inform practice, useful evaluation strategies to improve programs for youth, and promising programs that have insights for others. 10. JYD is online at jyd.pitt.edu - You can download PDFs of articles, submit and review online. 9. JYD is open access -- it's freely available for everyone to read and share. 8. Articles are indexed and can be found by search engines such as Google Scholar. 7. It is the official journal of the National Association of Extension 4-H Agents and the National Afterschool Association. 6. You can be notified when new issues are published -- just register as a reader. 5. Find 400+ articles from the past decade. Just search the archive by keyword, author or title. 4. Articles are peer reviewed to ensure they are valid, coherent and appropriate for JYD readers. 3. JYD is seeking reviewers. When you register, please identify your reviewing interests. 2. 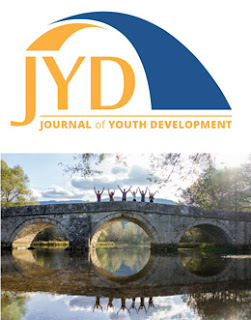 Follow JYD on Facebook and Twitter (@JournalYouthDev). 1. JYD is seeking regular submissions as well as papers for a spring 2018 special issue on the value of camp experiences. I encourage you to check out JYD: read it regularly, enroll as reviewer, and submit a manuscript! What questions do you have questions about the journal, or its review or submission process? YES! Do all of these things! Kate helped me get published after years of writing action research, and it was so supportive and accessible. I'm very grateful. Thank you Kate, for all you do for youth work practitioners and the field at large. I'm sharing this post on my reflective youth worker online community blog, Making Moments Meaningful, as well!